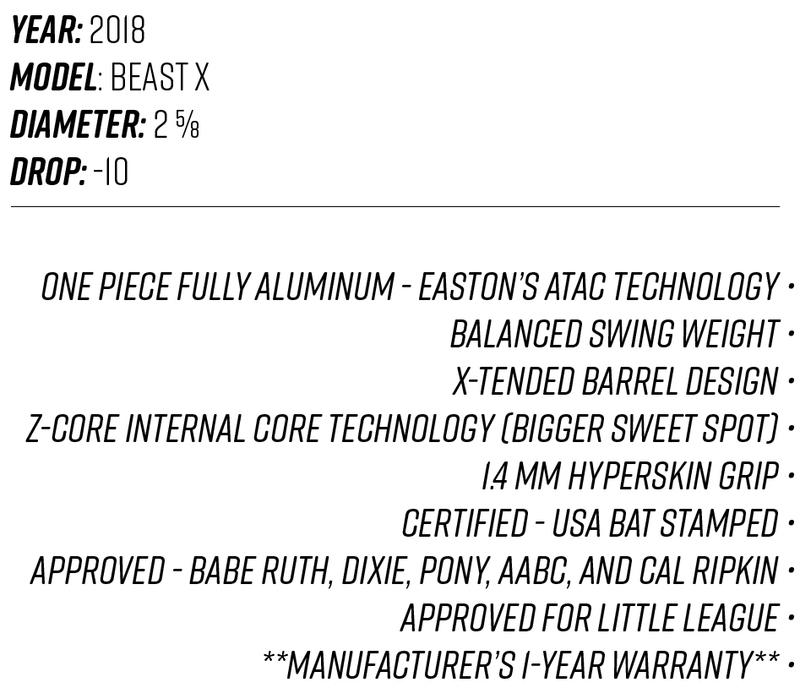 SUMMARY: When developing an all-aluminum youth baseball bat to follow the USA Bat standard, Easton produced the 2018 Beast X giving hitters with ultimate power, fast swings, supreme comfort, and strong durability. The Beast X -10 drop youth baseball bat features Easton’s Advanced Thermal Alloy Construction (ATAC) which applies an unmatched sound and explosive energy upon the baseball. This single piece fully aluminum construction showcases a large 2 5/8 barrel equipped with Easton’s X-tended barrel design and Z-CORE internal core technology. Both of these innovative mechanical enhancements indulge ball players with an enlarged sweet spot and the longest barrel in youth baseball. In being an all- aluminum youth baseball bat, the Easton Beast X offers an evenly balanced swing perfect for hitters who are looking to increase bat speed through the strike zone. The ATAC handle comes with Easton’s 1.4mm HYPERSKIN grip distributing supreme comfort and a natural feel when stepping to the plate. The 2018 Easton Beast X -10 drop is perfect for either contact or power hitters that might struggle catching up to pitches. Simply put, the Beast X youth baseball bat offers a great blend of speed and power. OUR REVIEW: For those youth players who prefer the feel speed and sound of alloy youth baseball bats, the 2018 Easton Beast X -10 received high praise from our volunteer hitters in all five categories. Prior to initial testing, we split those youth volunteers who prefer swinging with aluminum youth bats and those who prefer swinging with composite youth bats. When evaluating the Beast X, it was imperative for us to keep a low number of variables to avoid discrepancies in our data for our visitors. One simple way to keep from receiving a bias scorecard from our volunteers was to group them according to their preference of barrel composition. After approximately 250 swings, below is our official review of the 2018 Easton Beast X -10 drop youth baseball bat. POP: As expected, the level of pop generated from the 2018 Easton Beast X was significantly less than pop displayed of older Easton alloy youth baseball bats. When compared to our data from older reviews of youth bats abiding by the old USSSA standard, Our staff calculated an approximate net loss of 15-30 feet of distance from point of contact to first touching the ground (only using solid shots off the sweet spot for calculations. It bears mentioning that comparing any 2018 Easton youth baseball bat to their counterpart of year’s past simply isn’t fair. Every 2018 USA bat is going to experience a certain declining level of pop when match next to older USSSA youth bat models. During our review, the 2018 Easton Beast X -10 drop displayed significantly solid impacts upon the ball with a deafening sound. For an aluminum bat, the Beast X will distribute enough pop to make strengthen a youth hitter’s swing. GRIP & COMFORT: Just like the vibration control category, we monitor our grip & comfort data based on the feedback from our youth volunteer hitters. Of all the players who swung a 2018 Beast X -10, many stated that the grip felt fine and the fast swing speed enhanced confidence. The single piece traditional alloy feel of past Easton youth baseball bats are as satisfying as ever in the 2018 Easton Beast X-10. DURABILITY: The 2018 Easton Beast X sustained a lot of solid shots during our bat evaluation process. We have officially documented approximately 250 solid swings with this youth bat and at the conclusion of the bat evaluation, all of the Easton Beast X -10 drop youth baseball bats displayed handling marks and scratches but nothing that would impair performance or eligibility like dents, or cracks. OVERALL EXPERIENCE: Overall, the 2018 Easton Beast X -10 Drop gives hitters a quick and comfortably balanced swing with a loud crushing sound upon impact. It’s a great youth bat for those who prefer the lightweight feel and traditional grip of alloys.